CPI(M) Polit Bureau member Brinda Karat has said that, the election manifesto of the BJP released on April 8, is yet another election jumla. She was reacting to the questions regarding the BJP’s manifesto which emphasises on Ram mandir and terrorism, at a meet the press programme conducted by the Kerala Union of Working Journalists in Thiruvananthapuram on April 8. “A party which has ruled the country for the last five years surely should have a manifesto which will be accountable to the people for its unfulfilled promises made in 2014. Very first promise which the government should be accountable for is the dismal situation of unemployment. Modi had said he will create two crore jobs every year. But the very opposite has happened under his rule, particularly after demonitisation. According to the estimates, 1.1 crore livelihoods were lost. Therefore, the Modi government and the RSS are running away from the basic and fundamental issues for which they are answerable. “They are trying to hide behind the fake nationalism which they have manufactured. The people will not be diverted from their basic issues. When Modi is talking about the fight against terror, he should answer the questions, why incidents related to terror increased by 176 per cent under their rule and why there is huge increase in the deaths of soldiers and civilians. The parliament standing committee report after the terrorist attack in Uri, pointed out basic issues of intelligence and security. Were these implemented or not,” Brinda asked and pointed out that anybody who questions these, are labelled as anti-national. The Congress has shown through its actions that it is not capable of fighting the BJP. Its leaders practice policies of soft Hindutva which are reflected in the policies of the newly elected governments of Madhya Pradesh and Rajasthan. The BJP used NSA against minority community cattle traders in the name of anti-cow slaughter. The Congress has done the same. In Kerala, they are on the same side against the Left. In UP, they are dividing the vote against the BJP as has been stated by the leaders of the SP-BSP-RLD alliance. In Delhi, they have refused the AAP offer to fight the BJP together. In Bengal, against the BJP-TMC we had suggested a mutual no contest in their four sitting seats and the Left’s two seats. They refused. Clearly, for the Congress, it is not to Save India but their narrow and partisan interests that matter. They share the same economic policy commitments which are pro-corporate as the BJP. That is why Congress leaders, devoid of ideology, are jumping to join the BJP. 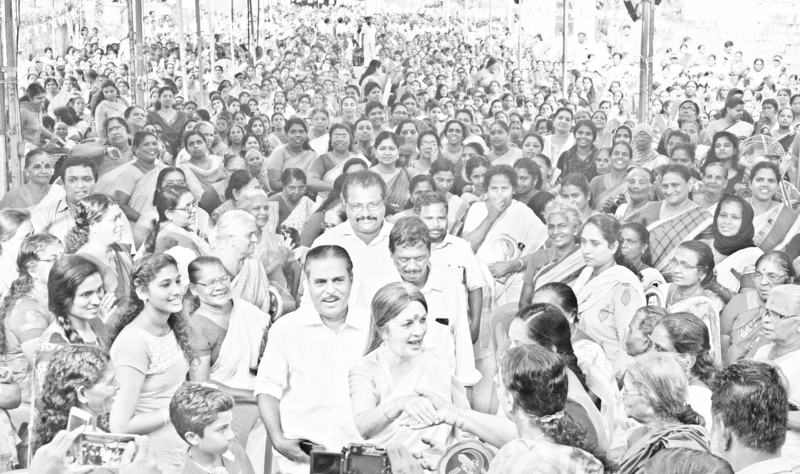 For Kerala, it is clear that the Left is the most consistent fighter against the RSS-BJP. That is why we say vote for Left candidates in all the 20 constituencies. A very strong presence of Left has to be ensured in the parliament. There will not be any compromise with anti-people forces. We believe that election of 20 MP’s from Kerala will, as has been shown in the past, ensure a much stronger people’s voice in the policies. We are committed to pro-people policies, we are against the economic policies which have led to intensify the inequalities, first started by the Congress government and continued more aggressively by the RSS-BJP government. That is why we need to ensure the strong presence of Left in the parliament.